Cavities are caused by the enamel of your child’s tooth breaking down over time – this is caused by plaque “holding onto” acids from sugary foods and then making these little holes in the tooth. Cavities are very common and are not a cause of alarm, especially if they are caught early. However, if left for too long, cavities can cause tooth decay. That is why we place such an importance of healthy oral habits! Brushing twice daily and flossing are the best means of preventing cavities to occur. For smaller cavities, we use a tooth-colored filling material to fill the cavity, and the tooth will end up looking just like normal. This is the quickest type of restorative care. When a cavity on a baby molar tooth is large or permeates multiple surfaces of the tooth, we use a stainless steel crown instead of fillings. Stainless steel crowns are strong, protect the baby tooth, and hold it together in one piece until the tooth falls out normally. These crowns are silver and shiny, and children often like their sparkle. This restorative care is stronger than a white filling and used for more serious cavities. Sometimes stainless steel crowns are temporarily used in permanent teeth if the tooth had root canal therapy or has severe breakdown from cavities. When a child is old enough, a general dentist will replace the temporary crown with a permanent one. If a cavity is so large on a baby tooth that it is touching the nerve of the tooth, your child will be in a lot of pain. If the cavity goes even further, it can cause an infection in your child’s tooth. For large cavities like these, we perform a baby nerve treatment, or pulpotomy, to hold onto the tooth until it falls out naturally. The part of the nerve affected by the cavity is cleaned out and medicine is placed inside the tooth. After that portion of the nerve and blood supply to the tooth has been removed, the tooth can become brittle and break easily. The tooth must be held together with a stainless steel crown to prevent fracture and premature loss of the tooth. Teeth with pulpotomies must be monitored closely with clinical examinations and x-rays in order to ensure conditions do not worsen. 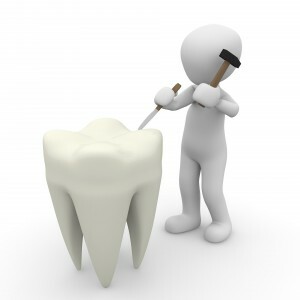 If a tooth has such a large cavity to where it cannot be fixed with a white filling or crown, or if the tooth is infected so significantly that the nerve of the tooth is dead, the baby tooth will need to be extracted. Baby teeth usually have a new tooth coming up behind them and so will be replaced naturally. Depending on the tooth removed and how old your child is, a space maintainer or a spacer may be recommended for your child to leave room for the permanent tooth to grow in. A spacer, however, is not needed for every extraction. An orthodontist may also recommend extractions in order to remove baby teeth that have not fallen out, or to provide better alignment for your child’s permanent teeth. With a referral from your orthodontist, we can help with these extractions.